Everyone has that earnest aspiration to succeed. One’s ability to establish and accomplish goals will mold one’s happiness and success over and above any skill one can ever realize. One can not hit the target when he can not see it, however if you want to succeed now is the time to believe. The foundation and point of origin of success is that when one decides exactly what he/she really and truly want, in all aspects of his life. If every individual has that yearning for winning, and if success is accessible to everybody, why then, only a few succeed? This is because only a few believe in their potentials, and most of all, only a few started by defining and acknowledging a goal, and truly believe in their spirit and minds that they can achieve that goal. Just wishing for something is so much different from being able and prepared to accept it. Nobody is ever prepared to accept anything until they truly believe that they can obtain it. The mind must first be in a state of believing and not just hoping or wishing for something. An open mind is important in believing and a closed mind never inspires courage, faith or the power to believe. Almost everyone had gone through difficult life encounters and experiences. These experiences and encounters usually define one’s existence, becoming important educators on life’s course. However, the enemy, which is that negative force within often would recognize these difficult experiences as symbols of thyself that one is not “good enough” in order to succeed. Simply put, this is fear from within. Fear, according to psychologists is normal and a natural line of attack focused to life’s adjustments and changes. Fear is what prevents one from doing “crazy or stupid things”; but it may be carried to a great extent. When one fears nothing, one can be considered as “mad” and “foolish” but then again, fear of almost everything, specially fear to take risks one can be considered as plain cowards. The enemy inside of you will tell you that your fear is reasonable when it is transitory. As the mind dictates your fear, it also dictates your thoughts and your actions. When you believe in your mind that relationships are complicated and demand so much effort, you will indeed attract those individuals who will cause difficulty in the relationship or demand a lot of effort from you. More significantly, when you worry regarding something that you essentially believe in negative outcomes, then so the result to your actions will be. Of course, it does not occur every time that you think and believe negatively, because Although there is worry and apprehension inside you, there is still, in that little corner of your heart, of your mind, that you hope for a positive result, so then, that power prevents disaster from happening. Yet worrying through and through, without a small spark of hope, then beware, disaster is sure to come! However there is so much more to faith and believing than simply creating beliefs. Possessing “positive beliefs” in the mind is the initial step towards making a positive outlook, resulting to a successful life. Believing, take note is something entirely different. For instance you have “positive beliefs” with regards to money; at the same time, you believe that many ways are offered in order to acquire money. Yet if, for any reason you do not believe you will be able to make money, then you will not make that certain amount or sum of money that you want. 1. Your belief should be superior, exceeding fear. It will entail a lot of effort, but as much as you can, try to closely observe and listen inside of you, look around and see what is functioning well in your personal or business life and what is not. Small or great, profess your successes. Believe that you can reach great things and as early as now, begin counting your blessings. 2. Only believe in you, in the things that you can do, and not in the circumstances. You have to believe in only yourself because there will be times when you will be tempted to put your belief into something else such as a job, a friend or a particular opportunity. Although this could be nice, note that people and circumstances are changeable. Your success should be created by only you, and you alone can decide whether to change it or not. 3. Keep in mind that success will take some time and if ever you do fail, take it as an opportunity to learn and reassess your beliefs and your goals. 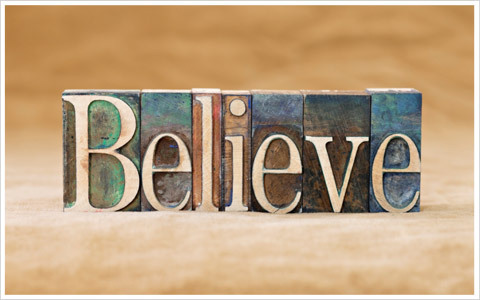 The powers of believing are very strong and affect our decisions, feelings, and actions. And although you have been depending on a specific set of supposition regarding your life for so many years, those particular beliefs can be adjusted or changed.